Taken from Wrapped in Color - 30 Shawls to Knit by Maie and Taiu Landra: "Lace patterns fan out from a vertical center line to form a triangular shawl with pretty crochet trim." 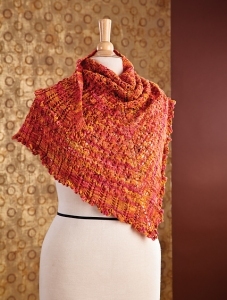 This pattern is from Wrapped in Color - 30 Shawls to Knit by Maie and Taiu Landra, pg. 102 - Rihanna. Size US 6 - 24 circular needle (or size needed to obtain gauge), a US C/2 crochet hook, and stitch markers are required but not included. Finished Measurements: 48" wide x 29" deep after blocking. Gauge: 14 sts and 25 rows over 4". $56.00 -- Kit price including yarn only (no book or pattern). $73.95 -- Kit price including yarn and pattern book.